Yes, Calamity and I are back from our short stint in Melbourne. You might wonder why we didn’t update you while we were there. Well, there’s two reasons: firstly I don’t own a smart phone and secondly there was absolutely no time to. This little trip will be covered by a few post. There is so much food for thought and more and more stuff is emerging. Today I will only give you a brief run-down on what happened over the three days. Friday we had to get up at 5am in the morning to catch the flight. It’s not my favourite time of the day, I can tell you! But it is amazing how much energy excitement can rustle up (Excitement is a puppet I don’t have yet!). It didn’t take long for Calamity to start embarrassing me. He showed up at the airport with a plastic bag for his spare robe and a large piece of bubble wrap as an extra blanket. Can you believe it? Doesn’t he know how to travel in style? He could have at least borrowed Mouse’s little pink suitcase. He said Mouse offered it to him but he didn’t want to be seen dead with pink. An exchange of words between us ensued which ended only when he wrapped himself up in his bubble wrap and rolled into the big plastic bag so he couldn’t hear me anymore. Anyway, we arrived in Melbourne mid morning. This gave us the entire day together, as the course started at 6pm that night. I instantly fell in love with the city. It has such an amazing arty feel to it and it is just brilliant how you can get around by public transport. To top it all off, the weather gods blessed us with a mild, spring-like day. We just couldn’t get enough of looking around and taking in all the people and places. Calamity, though, felt a tad self-conscious. He had this nagging feeling people were staring at him. I had a hard time convincing him it was all in his mind. But I think he never really believed me. At night I went to the course. It was a weekend puppeteering course run by Gary Friedman, who is a very experienced puppeteer and holds courses all over the world nowadays. In the late eighties he was the instigator of “Puppets against Aids” in South Africa, followed by other educational projects such as “Puppets for Democracy” and “Puppets against Corruption”. 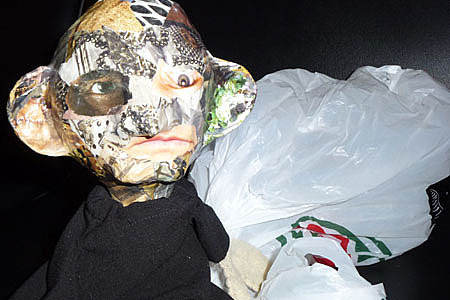 If you are into puppets, his blog Puppetry News is a treasure trove to rummage through. He also has a face book page, which he says is updated more regularly. The course was brilliant, really worthwhile. I’ve learned heaps. 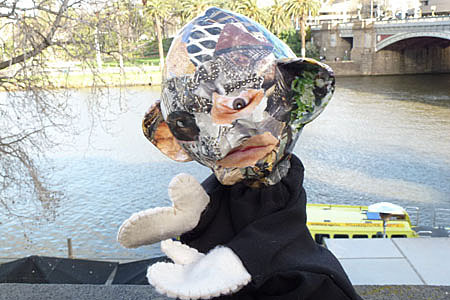 It was very intense and started off on Friday night with the introduction followed by two days of full-on puppeteering. I will write about the course tomorrow, but I can tell you, by Sunday night I was eeex-haaaaausted! Two full days without downtime makes my engine splutter big time. Last night we had just enough time for a quick dinner before we had to head back to the airport and we arrived in Auckland at 5:20 this morning totally shattered. But back to Calamity in Melbourne. On Saturday he was to explore the city by himself. Unfortunately, the weather had packed in and he couldn’t take many pictures. He hasn’t tired telling me of the wonderful time he had and how much he enjoyed himself. It’s a pity there aren’t any photos to prove it. I have yet to see one of Calamity with a smile on his face. Of course Calamity was curious about the workshop and pestered me all Saturday night to get me to take him with me on Sunday. 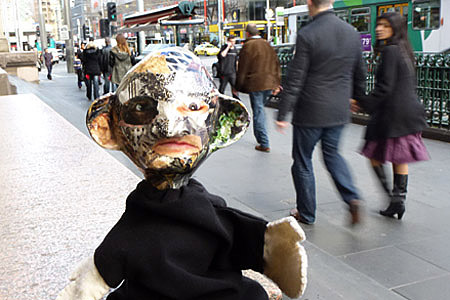 He was adamant he had seen everything there was to see in Melbourne anyway. Yeah right! He is really annoying when he wants something badly and I caved in and took him. The verdict is still out about whether this was a good idea or not. I will tell you about this later as well. For now I have to catch up on some sleep! Looking forward to hearing what you thought was valuable about the workshop.